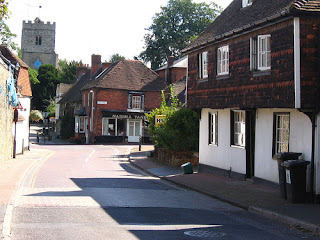 So what is next for number 1-3 High Street, East Malling? I've only ever known it as Nasima Tandoori, but from the photos I've seen the building has had a fruitful life as many different shops. The old photo below was sent to me by Diane Brazier and the other more recent one (7th September 2006) is courtesy of Stephen on flickr (http://www.flickr.com/photos/esteph/). The building is looking a bit sorry for itself and I hope someone comes along to give it a bit of love and attention that it deserves. And the same goes for the old bakery (Sweets n' Treats). Even if these properties became residential this would be a good outcome. They could then feature plaques detailing their history like the old post office, etc. If anyone has heard any information regarding these properties, please let me know or post here. In the 1940s and early 50s it was a general store serving the village and the annual invasion of hop pickers. It sold general groceries,cigarettes,sweets,over the counter medicines,knitting wools,drapery and cosmetics and it had a lending library. 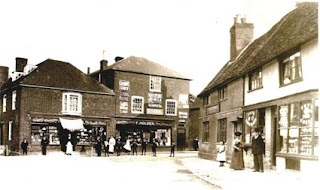 The shop round the corner in Church Walk was part of the store and was used as a cafe. the last time i visited nasima tandoori was on the 29th f november 2007 for my daughters birthday that was when it was a resturant. it was lovely inside it was very colourfull and the food was amazing and the staff were really really nice especially the owner mr. kobir ali he was very welcoming and made us feel apart of his team which was very nice but unfortunantly the councils took it off him which was very unfair because hw did a wonderfull job and where ever he is i hope he is happy and safe and his family and i hope some day son he will open anouther resurant called nasima tandoori and if he does i know where ill be goin gor my dauhters 18th birthday. mr kobir ali is a very lovely man and i hope to see him soon i once met his daughter and her name was nasima its such a beautiful name know wonder he called the resturant after her and she is lovely and has the most biggest and beautifull smile like father like daughter. so mr kobir ali if you are reading this i woudl like 2 say please make a new restuarant because there is no other resturant like yours!. In the 50's it was, first, Turner's then Balcombe (?spelling) and Dear's, the Dear's. It was a general grocer with a sweet shop that had its own entrance in Chuch Walk. then go towards the end of the list of sets. There are six sets of EM photos. Typo in previous post - should have read "then Dear's".